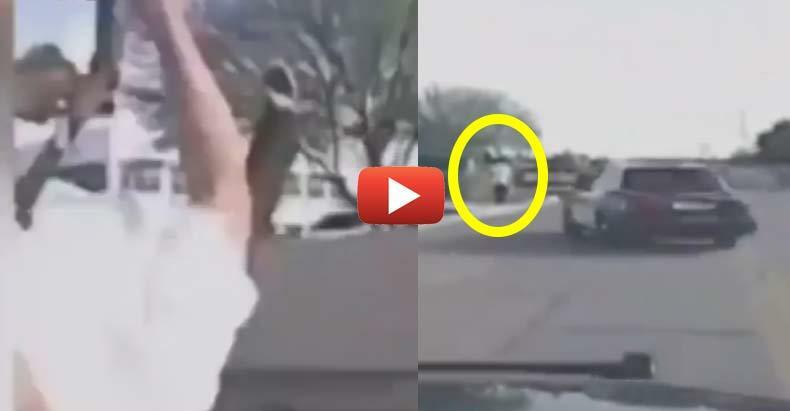 Marana, AZ — Chilling footage from the dashcams of two police cruisers was released this week that shows an Arizona police officer use his car as a means to take down a suspect. The first video is from the officer who was simply following the suspect down the street as he walked away. All of the sudden a cruiser passes him at high speeds and runs down the suspect. The man who was run over by the officer miraculously survived. Mario Valencia, 36, now faces several felony charges, including assault on a police officer. According to the Associated Press, Marana police Sgt. Chris Warren said Valencia robbed a convenience store in Tucson, broke into a church, invaded a home and stole a car. Valencia drove the stolen car to Marana, just north of Tucson, where he stole a rifle from a Wal-Mart. In some Orwellian attempt to justify the cop’s actions, Marana police chief Terry Rozema claims the violent takedown by officer Michael Rapiejko likely saved Valencia’s life. The suspect’s lawyer, however, disagrees, according to RT. Whether or not this man was actually guilty of a crime was not yet proven in a court of law. Deciding his guilt and punishment was not up to officer Rapiejko. In a civilized society, we have standards that allow for individuals to face their accuser. It’s called due process, and it is specifically in place to prevent this exact scenario of judge, jury, and executioner. When police feel that they can simply take lives without obeying the rule of law, something has gone terribly awry.